How can I pay HiBed? • 500€ to reserve it and will receive a discount of 1000 euro on the final price. How can I pay HiCan? • 1.000€ to reserve it and then we will send you finishes samples in 1 week. Which size of mattress is suitable for the beds? If there is only one mattress two adjustable bases works together (synchronized). If there are 2 mattresses bases work independently. Mattress thickness suggest is at least 20 cm. Ask our specialist and she’ll suggest you our local partner, offering you the best suitable mattress solution for our products. We’d love to help answer all of your questions. Please contact our press office at: [email protected]. We are happy to discuss partnerships with potential furniture dealers interested. Hi-Interiors is considering offering exclusive product placement opportunities for specific countries and regions. Will my smart bed sync with smart Internet of Things (IoT) devices? Hi-Interiors’s smart beds are not based on traditional home or building automation components, but uses technology at the root of what is now called IoT. The controller’s logic is based on the very popular Raspberry Pi computer, enhanced with the professional Strato Pi board. Everything is open source. 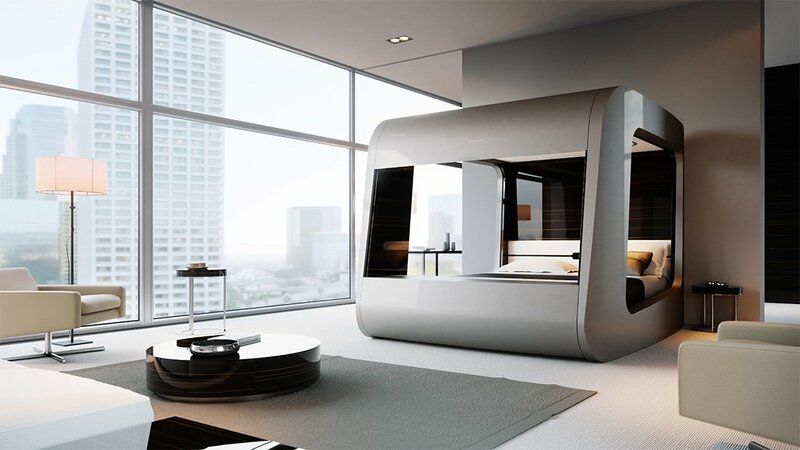 Leveraging the immense choices of sensors and devices that are already available or will be introduced in the future, the bed become a fully customizable platform, with potential for further innovation that goes beyond the wildest imagination. Can I use multiple devices to control my smart bed? Yes. The app is free and a single bed can be connected to multiple devices (smartphones or tablets). For instance, if there are two people in the bed, they both can be primary users on their device(s). Will my smart bed work with Windows, Android and/or iOS? Our app is designed to work with any web-enabled device, with extra features to enhance the experience in our native app for iOS and Android. Can I choose what colour I want for my smart bed? Yes, each bed is built to order. We have selected a number of finishes that enhance the iconic design of our smart beds and make it easy to contextualize them in your interiors. As soon as we receive your reservation we will send you the sample box with materials in order to let you choose the ones that best interpret your personal taste. We can also reproduce any custom finish your architect and / or interior decorator may require. When is the soonest I can get my smart bed? Production lead-time is estimated in 90 days circa, from order confirmation, not including shipping and custom procedures that may vary significantly depending on destination. In average shipping and custom clearance requires additional 30 days. Can I test your smart beds? We are working to provide the opportunity to experience sleeping a night in our smart beds in several locations around the world. Stay tuned! Am I going to receive an invoice for my reservation? Your reservation payment is refundable. An invoice will therefore not be available until the reservation is converted into a confirmed order. However, we will send you an official confirmation of your reservation payment by email. Yes, until your order is eventually confirmed, you can cancel your reservation at anytime by sending as a request by email at: [email protected]. Refunds can take up to three weeks. The refund will be net of commissions paid to the payments system provider (5%). What about sales tax / VAT and import duties? You are responsible for paying any taxes and import duties, which apply in your country or state. Please note we’ll inform you confirmed cost for such taxes prior to finalise your order and actually start production. How do I reserve my HiBed? HiBed is not yet ready for actual sale. The first HiBed production is available in pre-order mode with a refundable deposit of 500 Euro. The early adopters, who will perform it by 30 September 2018, will have guaranteed delivery within the first half of 2019 and the right to enjoy an “Early Bird” discount on the final purchase price. Click here. All shipping in Italy is free of charge. There is additional cost for international shipping. Shipment does not include extra fees from customs, or additional costs associated with your country. If it turns out that shipment to your country proves impossible, we will reimburse eventually your reservation.